The Russian-Indian joint venture KAMAZ Vectra Motors Ltd. (KVML) is planning to introduce five new truck models to the Indian market, according to KVML Director Denis Trifonov. “Starting in April, we will begin introducing to the Indian market such models as the 6x4 dump truck, the 4x2 and 6x4 tractor trucks, the 8x4 long-wheelbase chassis and the 8x4 heavy-duty truck,” he said. Only one model that is complicated to manufacture – the 8x4 dump truck – is currently under production at the KAMAZ plant in India. Some 250 of these models are to be sold in India before the close of the current financial year, which ends in March. “The 8x4 dump truck is the first model we started producing for the Indian market. The truck is highly modern and advanced. We were the first to offer such a product in India and have created a trend in this market segment,” Trifonov said. The trucks are manufactured in accordance with local traffic regulations and have right-hand side steering wheels. The 8x4 dump truck model is in high demand in India, Trifonov said. At present, the company is producing ten different modifications of this model with the aim of satisfying the specific requirements of its customers. Other manufacturers, both local and foreign, are now trying to introduce similar vehicles to the Indian market, he said. “Competition has appeared, but we are ready for it,” he said. KVML pays special attention to servicing the aftermarket trucks. The company has dealerships in 15 of the country’s states, as well as in Bhutan. “Our job is to not just produce the vehicle but also manage its operation,” Trifonov said. Trifonov said the Russian-Indian joint venture is receiving orders regularly for its vehicles. “Interest in our products has already been seen outside of India in such neighbouring countries as Bangladesh, Sri Lanka and Indonesia,” he said. The KAMAZ model sold in India is currently on display at the International Construction Industry Exhibition in Mumbai, which opened today. As part of the exhibition, a ceremony will be held to hand over keys from 30 KAMAZ trucks. The Russian-Indian joint venture KAMAZ Vectra Motors Limited was established last February in the city of Hosur in the southern Indian state of Tamil Nadu. The company plans to produce 5,000 vehicles per year. 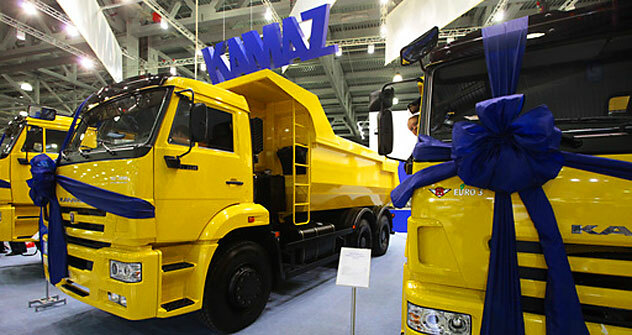 The Indian plant is KAMAZ’s fifth joint venture operating outside of Russia. The other four are in Kazakhstan, Pakistan, Iran and Vietnam.